How do I measure my kitchen for the estimate? Measuring countertops is not difficult. The measurements will help our sales representatives to give you an estimated price for your granite countertops when you visit our showroom. Make rough sketches of the floor plan of your kitchen. This does not have to be accurate. This process helps to get the layout of your kitchen. 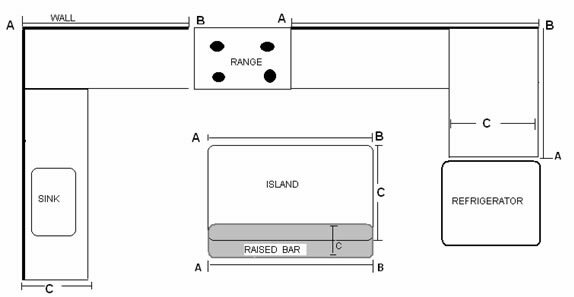 ~ Use your tape TO measurethe length (A&B) and the width (C) of your countertops. ~ Write down the measurements in "Inches". ~ Measure till the edge of your appliances unless the appliance goes under the countertop completely, such as dishwasher. STEP 3: ADD SQ. FT FOR EACH SECTION OF YOUR COUNTER TOP & THEN ADD THEM ALL UP TO GET THE FINAL SQ. FT. OF YOUR COUNTER TOP. Will my countertops have seams? Does Granite lose its polish over the years? Does Granite require a lot of maintenance? Does Heat cause granite to chip and crack? Can I cut on my countertops? Can I use Marble for kitchen counter tops? I've noticed some granite have pits on the surface - will I have these on my kitchen counters? What is the difference between a drop-in sink and an under-mount sink?